Will McCabe arrives in New York City with specific instructions - bring Samantha Holmes back to Laramie, Texas, for her estranged brother's wedding. Reluctantly she agrees to go with him. But Samantha's determined not to stay...and not to fall for the irresistible Will. Convincing the fiery brunette to come back with him is one thing. But Will realizes he does want her to stay in Laramie - and convincing her to do that is another thing altogether. 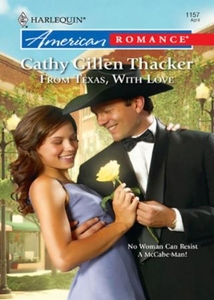 To Samantha's surprise, life in small-town Texas is beginning to grow on her, and so is Will. Does that mean there could be two weddings in Laramie?